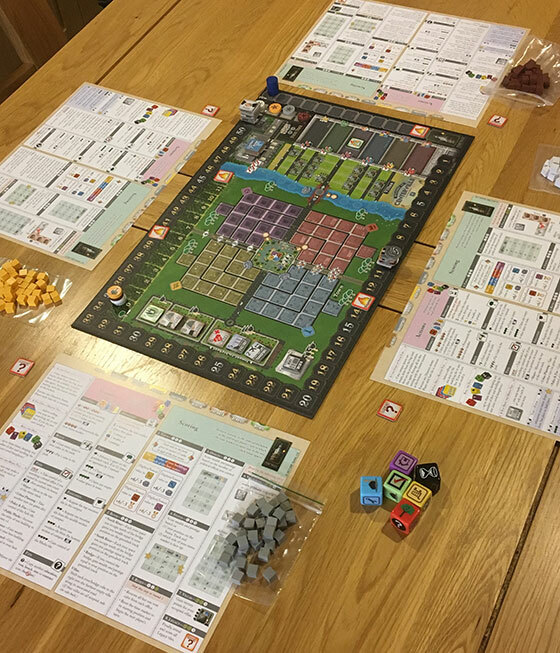 An interesting mix of Yahtzee-style dice rolling and abstracted area control, Welcome to Centerville uses the idea of populating a city with cubes as a way of scoring points in a race to be the overall winner after three scoring rounds. It is played on a relatively small board with an attractive but intricate layout and it supports up to four players, with a solo mode included in the box. 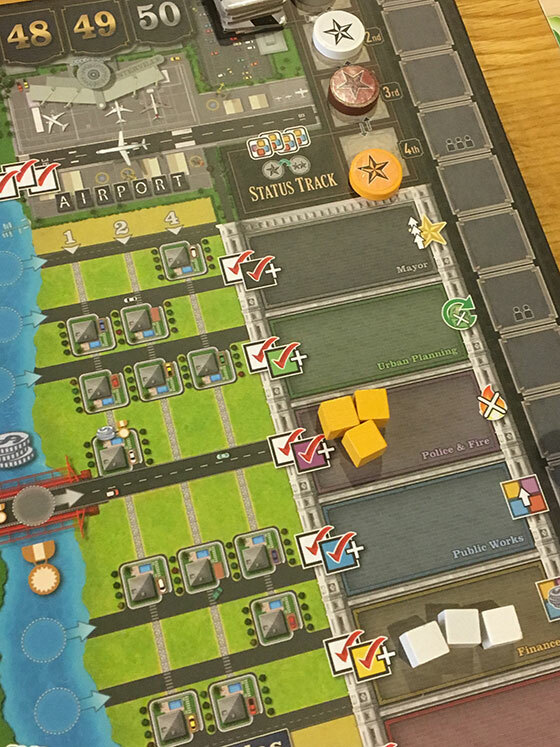 A game from veteran designer Chad Jensen, Welcome to Centerville features a fair amount of luck (because it is based largely on dice rolling) but it also comes with so many different ways to score points that it is quite hard not to do something meaningful each turn. The turn structure is quite simple and moves at a good pace, but the overwhelming number of choices can slow things down with newer players. This is partly because players need to keep track of two separate victory point tracks – wealth and prestige. The catch is that when the final scoring happens, players count only the lower of their two scores to determine who the winner is, which means that players need to focus on both ways of scoring. 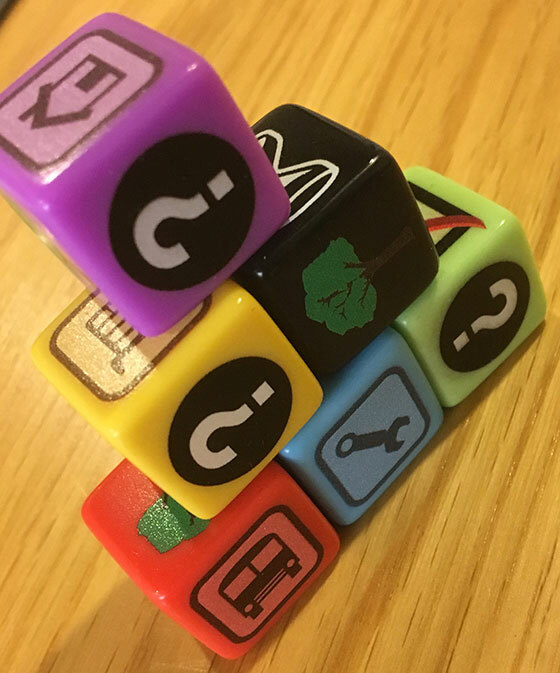 As I said, Welcome to Centerville is dice rolling game, so each turn, the active player rolls the customised, six sided dice up to three times. Any die can be rerolled unless it shows an hourglass (which represent the march of time and must be kept) but each time you choose to keep one, it is locked. After up to three rolls, players assess the die faces and decide what to do. The number and combination of available faces is quite considerable and the colour of each dice matters as well. Single trees, for example, allow players to advance the Greenbelt tracker, whilst three or more trees offer access to much more valuable areas of the board. Contracts allow players to place buildings in the city zones – the more contract die spent, the higher value building you can place. These simple explanations hardly scratch the surface of what is possible (and necessary) in Centerville in order to secure success however. There’s a set collection aspect related to rolling vocation symbols and drawing the associated jobs (either varied sets or suits of the same kind) as well as a “take that” angle relating to securing public offices and pushing other players down the status track. On that note, I should mention that it’s not always about just what the dice show (although it mostly us.) Movement on the status track, for example, generates favours for any player in top position that is bumped down. Favours can then be spent on a number of specific actions and carry broadly the same benefit as a single die face, albeit one that need not be rolled. The public offices that can be secured as a result of obtaining enough votes (or more votes than the player that currently occupies it) can also confer benefits that exist off board. For example, a safe token is given to the player holding the Police and Fire Department Office, meaning that he or she is immune to the effects of a disaster, should one be drawn from the vocation bag. Scoring, which happens three times each game (as dictated by the time track, which moves forwards when hourglasses are rolled) with the final scoring representing the end of the game. 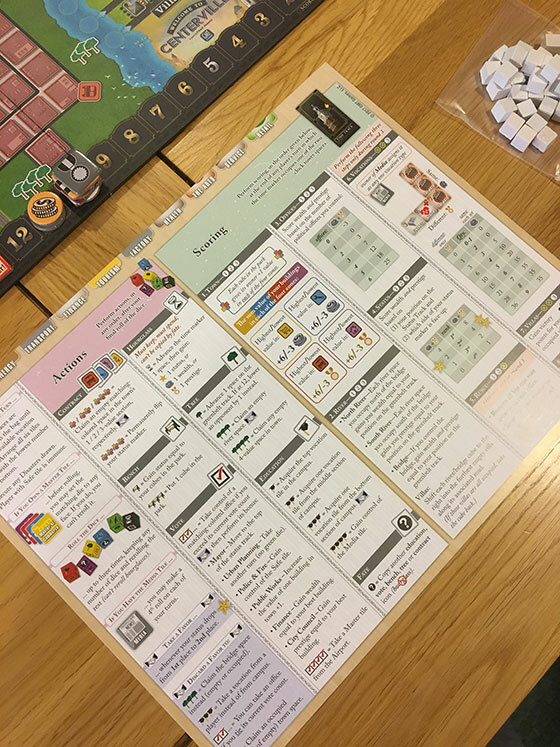 Scoring is a fairly heavyweight affair at first, with each of the myriad of separate areas both on the board (The Town, The River, The Status Track, The Villas and erm… The Political Offices) and off it (The Vocations) all scored. 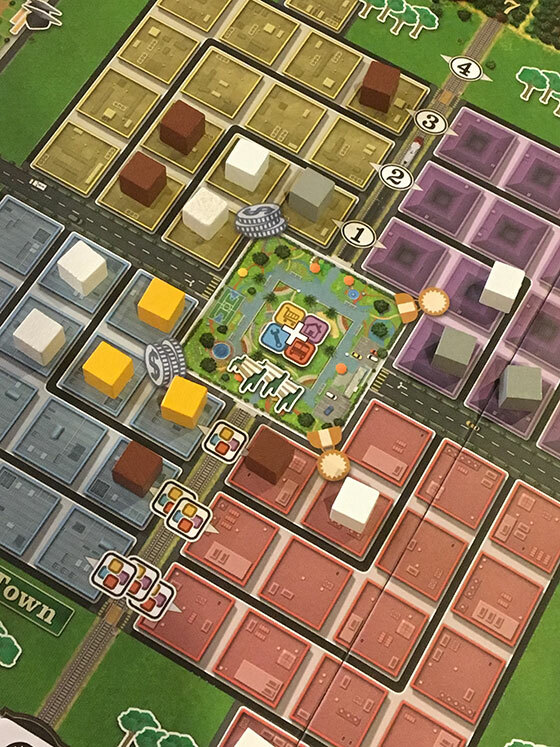 There’s a fantastic player aid and a very solid manual to guide players through Welcome to Centerville, so please don’t get me wrong; you’ll get used to it after a few plays. There’s also a bot capability which can be used either solo or to replace one or two human players in a multiplayer game. I played two games with bots and if I’m honest, I found the increased downtime (given that there is already quite a bit) to be a bit too much of a chore. And that downtime, really, is really my only criticism of Welcome to Centerville, except perhaps the luck aspect, which is also a fairly minor complaint. Between the rerolls and the inclusion of fate symbols on some faces (that can replicate any other dice rolled) there’s a decent chance of getting something useful, so even that isn’t a big issue. Welcome to Centerville offers a good level of depth for players that are willing to invest the time. Of the five or six different people I’ve played with, I’d say half of them have really got to grips with it, whilst the others would probably play again, but might lag behind a little in terms of competitiveness due to the complexity of decision making. 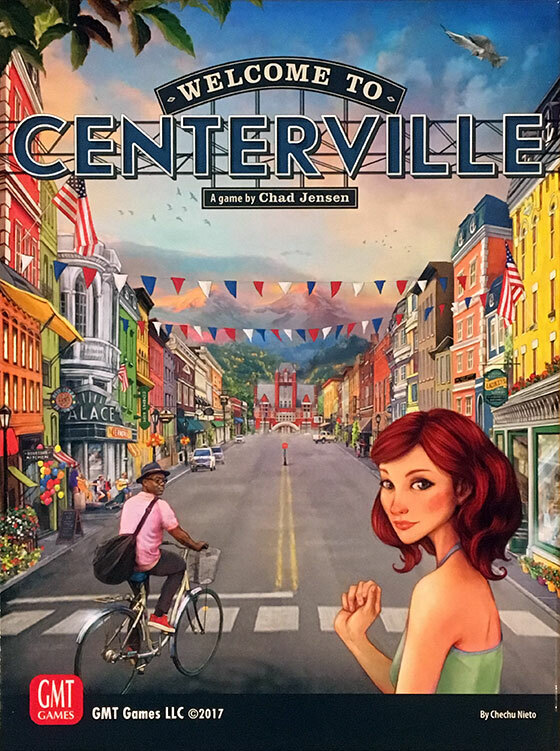 Ultimately, Welcome to Centerville is a dice rolling game that builds a reasonably compelling board game around it. The city building theme isn’t the strongest visually, but each of the mechanisms does link to it in a scattergun kind of way. For perspective, I’ve always enjoyed Quadropolis, which uses a tile drafting and placement mechanism wrapped into a similar, city building theme. 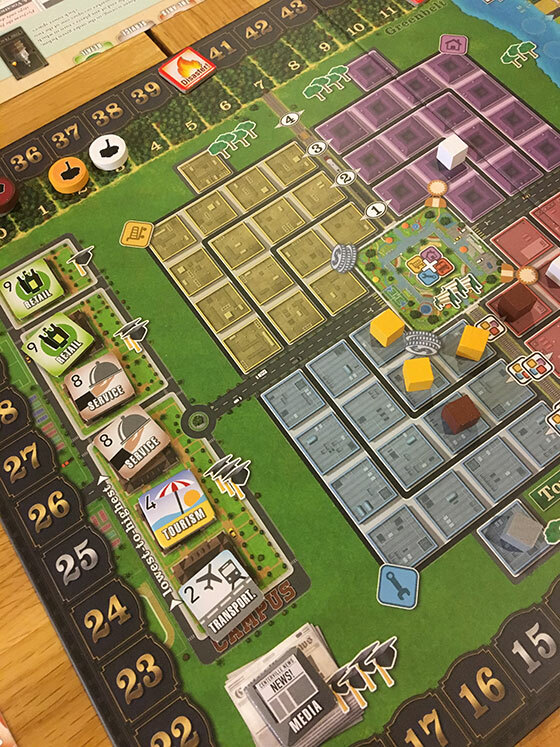 I enjoyed Welcome to Centerville very nearly as much, although I must concede that it isn’t quite as simple to pick up and play. All the same, that’s fairly high praise I’d say.